Does Cumin Spice Cause Gas or Bloating? What Is the Difference Between Fenugreek Extract and Fenugreek Seed? Adding fenugreek to your recipe produces exotic cooking aromas. Its official Latin name isTrigonella foenum-graecum. The herb is known worldwide by other names including hulba, hilbeh, shanbalile, funugrec, seregre, trigonellle, bockshomklee, mi, meti, vendayam, vetani, methi and shanbalid, according to spice expert Gernot Katzer. The jury is still out on the effect this herb may have on your digestive system. Before using fenugreek or any alternative or complimentary product, it is important to talk with your health care provider to determine its appropriateness for you. The use of fenugreek cannot replace conventional medical treatment. If you enjoy Indian food, you may have experienced culinary fenugreek. It is an ancient herb that was grown as a medicinal plant in Europe during the Middle Ages. The first record of its use was found in an ancient Egyptian papyrus, which dates back to 1500 B.C. It is a member of the bean family, and its seeds and leaves are used to flavor cooking in India, North Africa and Asia. The herb has also been used as an alternative therapy to treat multiple health disorders. According to the National Center for Complementary and Alternative Medicine or NCCAM, fenugreek has historically been used for a variety of health problems. The leaves can be prepared like spinach. The seeds are dried and often ground and added to flavor exotic dishes. The spice has a somewhat bitter flavor but emits an aromatic aroma when added to cooking. It is grown in areas from China to the Mediterranean. 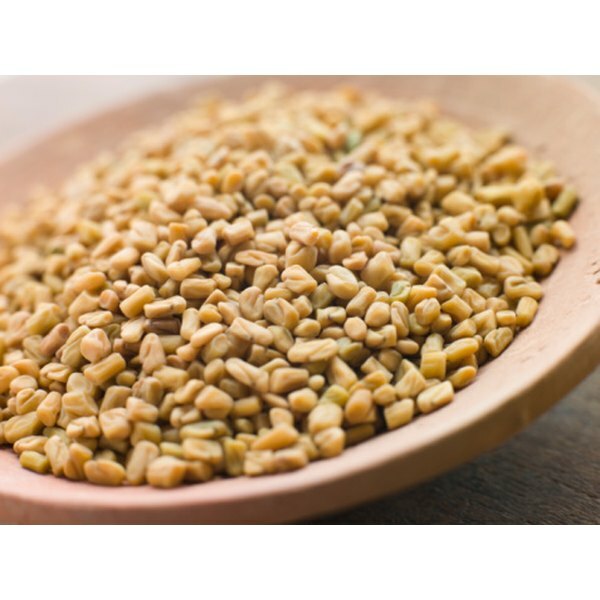 NCCAM instructs that historically, fenugreek was used to treat menopausal symptoms, digestive problems and to induce labor and childbirth in pregnant women. More recently, you may have heard that it is being tested as an adjunct treatment in diabetes, heartburn and appetite loss. In some countries, it is used to stimulate milk production for women who are breastfeeding. This versatile herb is also used by some to treat skin irritation. An article from PubMed, U.S. National Library of Medicine, National Institutes of Health titled, "Anti-heartburn Effects of a Feunugreek Fiber Product," found that people with frequent, mild heartburn got relief from using a fenugreek fiber product 30 minutes before their meals, two times a day. However, according to NCCAM, if you eat and swallow the herb, you may experience gas, bloating and diarrhea as a side effect. You may also experience similar digestive symptoms if you enjoy favorable foods prepared with the spice. It is not clear from the reference if the fiber product used in the study is the same as the conventional ground preparations widely available. If you have digestive system issues, talk with your health care provider before using this herb. The herb seems to be an enigma; it appears it can both cause and reduce gas and bloating. It is also reported to soothe and cause skin irritation. Fenugreek is available in seed form and ground to a powder. You can mix the powder with water to create a paste that can be applied to your skin. The herb is also available as a tea or in capsules to swallow. You may find it at your local vitamin or health food store, or on the Internet.